Virginia big-eared bats. Photo courtesy of U.S. Fish and Wildlife Service. 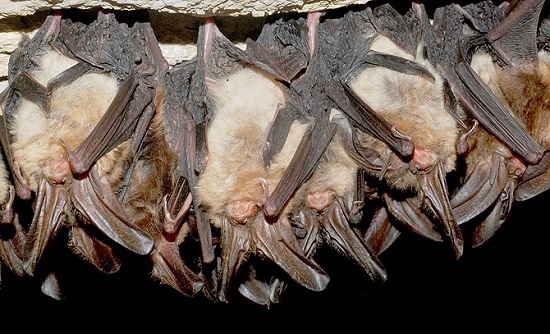 Published in 2012, the U.S. Forest Service publication Conservation and Management of Eastern Big-Eared Bats brings together the latest knowledge about eastern big-eared bats. Edited by Forest Service Southern Research Station (SRS) researcher Susan Loeb, University of Kentucky professor Michael Lacki, and Weyerhauser manager Darren Miller, the publication features proceedings from a 2010 symposium. The publication represents the first synthesis of this information, much of it previously unpublished, on one of the most common group of bats in the eastern United States. All of the eastern big-eared bat species are of special conservation concern and at risk due to habitat loss, disturbance to caves and summer maternity sites, environmental contaminants, genetic isolation, and disease. Once you’ve seen them up close, big-eared bats are hard to forget. Their ears are indeed large, sometimes a quarter of the animal’s total length. Big-eared bats are also sometimes known as “lumpy-nosed” bats because of the mitten-shaped glands that lie on either side of their noses. Because of their looks, big-eared bats (genus Corynorhinus) are some of the most recognizable bats of the eastern United States, in a range that extends from West Virginia to Texas and includes Rafinesque’s, Virginia, and Ozark big-eared bats. Because of these limitations on research, relatively little is known about the size and nature of communities of big-eared bats, their favored habitats, and their responses to forest management. Access the full text of the proceedings.